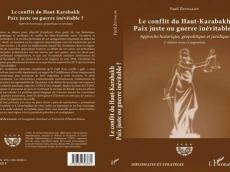 French L'Harmattan publishing house has issued the second edition of the book titled "The Nagorno-Karabakh conflict, fair peace or unavoidable warfare: historical, geopolitical and legal view". Written by Fazil Zeynalov, a teacher at Baku State University, the book is based on real historical facts of the Nagorno-Karabakh conflict. While exploring the ancient history of Azerbaijan’s Karabakh region based on the Albanian historiography and medieval sources, the author points out that the Nagorno-Karabakh region was an integral part of Caucasian Albania. The local population of the Nagorno-Karabakh consisted of Caucasian Albanians, who have retained their identity for a long period. “The Nagorno-Karabakh has always been part of the Azerbaijani states and played an important role in political, economic, social and cultural life of Azerbaijan,” Zeynalov believes. The book sheds light on the events took place on August 15, 1919, when the Armenians living in the Nagorno-Karabakh admitted the rules to reside in Azerbaijan and recognized the status of an autonomous region within Azerbaijan SSR, which was given to the Nagorno-Karabakh on July 5, 1921. The author also explores political processes in this region after the breakup of USSR, as well as analyzed the interstate nature of Nagorno-Karabakh conflict and separatist tendencies of its Armenian residents. At the same time, the book emphasizes the need to resolve the conflict in accordance with the norms and principles of international law based on compromise of the parties to the conflict. Armenia occupied over 20 percent of Azerbaijan's internationally recognized territory, including Nagorno-Karabakh and seven adjacent regions, after laying territorial claims against its South Caucasus neighbor that had caused a lengthy war in the early 1990s. As a result of Armenia’s military aggression, over 20,000 Azerbaijanis were killed, 4,866 were reported missing, almost 100,000 were injured, and 50,000 were disabled. Large-scale hostilities ended with a Russia-brokered ceasefire in 1994 but Armenia continued the occupation in defiance of four UN Security Council resolutions calling for immediate and unconditional withdrawal. Peace talks mediated by Russia, France, and the U.S. have produced no results so far.